DIY attic cleanout. Talk about a boring, laborious chore. Sure, it’s not exciting. And, it’s not something that totally transforms a home. But, it’s time. That attic is full of clutter. It’s stuffed with boxes galore and all sorts of knickknacks, furniture, and whatnot, that you couldn’t name more than a few items. Of course, this isn’t something most people relish but it’s got to finally be done. After all, there’s a lot of usable storage space and it’s worthwhile to recapture it. If you’re handy enough, you can convert your attic into livable square footage. At the very least, you can arrange and organize it into a useful storage space. The trick is to maximize what’s available while not going overboard. 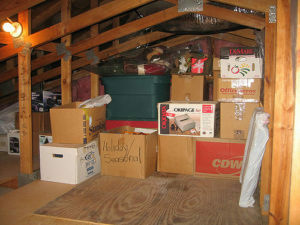 Though a converted attic can be a great resale feature, some people prefer it to remain as a storage space. Before you just rush into it, understand what will cause problems to crop up. For instance, you shouldn’t just go into the space and start carrying things out without creating a clear foot path. That’s a big mistake. If you don’t have a pre-prepared pathway to follow, you’ll risk tripping and other hazards which will only anger and demotivate you. Also, don’t make the mistake of not inspecting the space. Clear a pathway. Don’t do anything else until you’ve taken the time to clear an unobstructed pathway from the attic to the outside of the house. It’s best to have a clear pathway without any tripping hazards. Move any furniture and let others know what you’re doing. Identify everything inside. Go through everything that’s in the attic space. Open every box, trunk, or storage bin to see what’s inside. This will help you to pare down and separate the junk from valuable, sentimental, or useful items. Empty out the whole attic. Next, you’ll need to empty out the space, leaving nothing inside. This way, you’ll have more motivation to get rid of things rather than just put them back. When it’s time for an attic cleanout, just phone 800-433-1094 or visit Junk Garbage Removal.